As always, I find it impossible to keep up on this blog with all the movies I’ve been watching. I suppose I could use the weather as an excuse – this has so far been such a bitterly cold winter that I’ve been hunkered down in front of my TV more than usual … but truth is, I’m pretty much watching the same amount as I do at any time of the year. The viewing just outstrips the amount of time I can devote to writing about it. So here’s another quick summary of some of the movies I’ve been watching lately, and as always they range widely in terms of quality, genre, nationality … with a perhaps embarrassing ratio of “trash” to “art”. 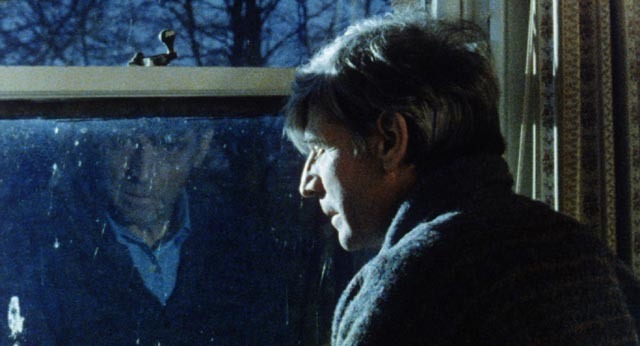 Sleepwalker (1984) is one of those odd, peripheral titles which the BFI’s Flipside has been so good at unearthing. Made by Saxon Logan, a South African who became a protege of Bill Douglas and Lindsay Anderson at the BFI, from a commercial point of view it has several strikes against it, the first being an awkward 51-minute running time. Perhaps even more problematic from a distributor’s point of view is the way the film confounds genre expectations; on the surface, it looks like a horror film (a remote house, a storm and power cut, intimations of violence and psychopathology), but it’s not actually scary or even suspenseful. In fact the old-dark-house horror facade is a sly joke because the film is actually an allegory of the politics of Thatcher’s England. 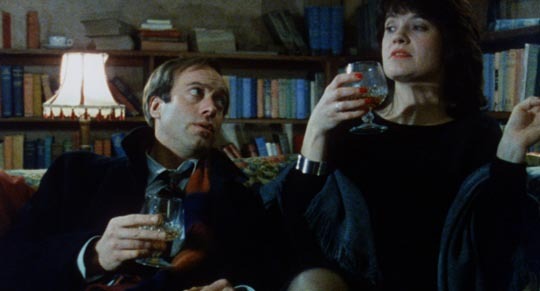 The remote house (named Albion, the ancient name for Britain) is home of Alex (Bill Douglas) and Marion Britain (Heather Page), a brother and sister who can barely stand each other – he’s suppressed and passive-aggressive, she’s aggressive and openly contemptuous of his out-dated lefty sympathies. On this particular evening, they’re hosting a party for another couple, Richard Paradise (Nickolas Grace) and his wife Angela (Joanna David). Richard is an aggressively amoral businessman who argues for the value of unfettered capitalism and the benefits to third world workers of being exploited by western corporations. He and Marion are temperamentally well matched and openly engage with each other in front of Alex and Angela. As the house and the meal collapse around them, forcing a temporary retreat to a local restaurant where the levels of contempt reach monumental proportions, Logan paints a graphic and bitter portrait of the destruction of national and communal identity in the face of Thatcher-inspired self-interest and greed. The horror which is promised by the moody and atmospheric setting and opening scenes turns out to be the horror of Britain’s political and social destruction. The two couples are necessarily types rather than psychologically and emotionally fully realized characters, but Logan and his cast fill the film with acutely observed details, all richly photographed by Nick Beeks-Sanders, who has had a very long a busy career as a camera operator, but strangely has almost no other credits as a director of photography. 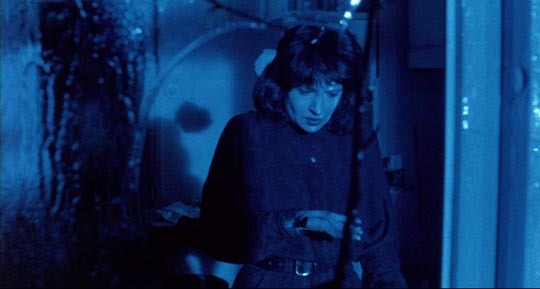 The Flipside Blue-ray also contains two short films made by Logan at the BFI, Stepping Out (1977) and Working Surface: A Short Study (with Actors) in ‘the Ways’ of a Bourgeois Writer (1979), both of which play with ideas about identity, gender, sexuality, and the nature of creativity. There’s also a feature-length interview with Logan dealing with the making of Sleepwalker and the shorts, and the relationships he had with Douglas and Anderson. 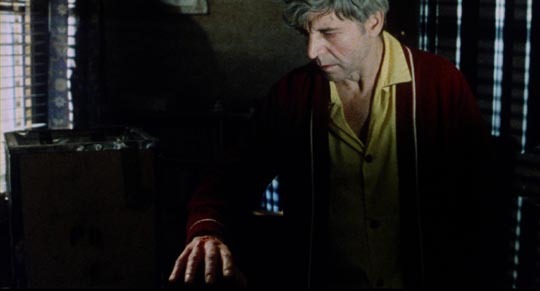 And as if that weren’t enough, there’s an additional short feature, The Insomniac (1971; the title really the only thing that connects it to Logan’s film), the sole drama directed by documentary filmmaker Rodney Giesler. This follows the peculiar adventures of a middle-class, middle-aged man whose insomnia seems to propel him into an alternate reality which mixes various degrees of sexual temptation with paranoia and hints of violence and humiliation. After his international breakthrough with La Haine (1995), Mathieu Kassovitz’s directing career took second place to his work as a busy actor, and nothing which followed came anywhere near the power and quality of that feature. Having hit bottom with Babylon A.D. in 2008, he made a recovery three years later with Rebellion (2011); based on an actual incident which occurred in 1988 on a small island in the South Pacific which is part of New Caledonia, a collection of islands still under French colonial rule. When a group of indigenous separatists raided a compound of the gendarmerie on Ouvea, killing three, critically wounding a fourth, and taking thirty hostage in two groups, a negotiator was sent with a team from France to negotiate an end to the situation. The film follows this process, the complex efforts of Capitaine Philippe Legorjus (played by Kassovitz himself) to connect with the rebels and defuse the escalating tensions. Unfortunately, the hostage-taking occurred during a presidential election, with Mitterand and Chirac both facing pressure from the Right; a show of force was demanded to reassert “national honour” and restore (as the original French title puts it) “order and morality”. The film painstakingly details the process of establishing trust with the separatists – a group with entirely justified grievances, strong communal ties, and as much of a desire to end the situation as Legorjus. This work is paralleled by the relentless movement towards a military “solution” which disregards any consideration of the political nuances as well as the safety of the hostages; what’s most shocking about this display of colonial arrogance is that it all occurred so recently. The sense of anger about the unnecessary slaughter with which the situation ended is all the more powerful for Kassovitz’s restraint both as director and star; as filmmaker, he presents the events carefully and almost dispassionately; as actor, he portrays Legorjus as an intelligent, empathetic man who is ultimately helpless against the machinations of his political and military masters who gain their own sense of worth from the exercise of violent power rather than reason. Rebellion is his best film since La Haine, crafted with assurance and lushly photographed by Marc Koninckx. Working with a strong script and a good cast, Altman tackles the story in a straightforward, naturalistic manner (already showing his penchant for overlapping dialogue and realistically messy scenes); there are no villains, no conspiracies, just a government more concerned with appearances than with the safety of the people it throws in harm’s way. While Countdown may not exhibit many signs of the Altman style to come, it’s a well-crafted, absorbing drama from that time when stories of space flight were shifting from science fiction to realism. 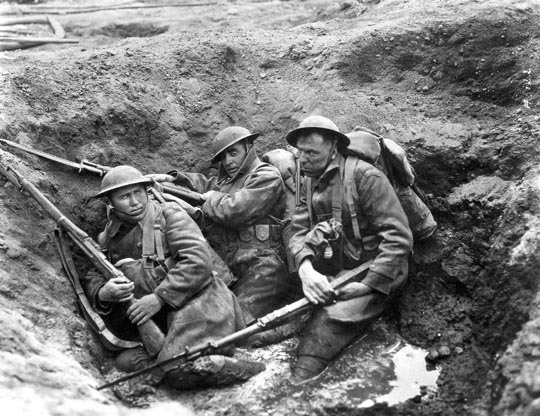 I was surprised while watching King Vidor’s celebrated World War One epic – surprised, that is, by the increasing feelings of disappointment which overtook me. This had nothing to do with the quality of the Blu-ray and the restoration, which are quite spectacular, but rather with the film itself. Lauded when it was first released as a devastatingly realistic depiction of the war, today The Big Parade seems to do everything it can to avoid and mitigate the real horrors of that conflict in favour of strained comedy, cliched romance and sentimentality. But that’s the odd thing about “realism”: it changes with the times, and one period’s realism becomes the next’s contrivance (how long did it take for hand-held shaky-cam to wear out its welcome?). 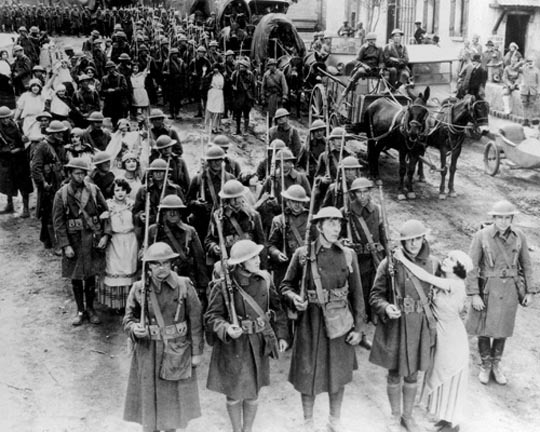 The Big Parade starts promisingly with a rather disturbing depiction of the elated thrill all levels of American society felt at the idea of going to war – it looks like a fun adventure for the working man and the upper class twit alike. Lazy, self-absorbed Jim Apperson (John Gilbert) at first doesn’t see that it has anything to do with him and is rather disturbed when childhood sweetheart Justyn Reed (Claire Adams) gushes about how thrilling it will be for her to see him go off in uniform. But when his car gets blocked by crowds cheering in the street and he sees a carload of his friends heading off to enlist, he gets caught up in the excitement himself and signs up. There’s a brief bit of boot camp during which Jim meets and befriends barkeep Bull (Tom O’Brien) and tobacco-chewing, endlessly spitting riveter Slim (Karl Dane, in the film’s worst display of silent acting technique), and then it’s off to France, where they’re billeted in a small village. And where they stay … and stay … and stay for what seems like forever, and is certainly for much longer than necessary for Jim to meet and fall in love with farm girl Melisande (Renee Adoree). 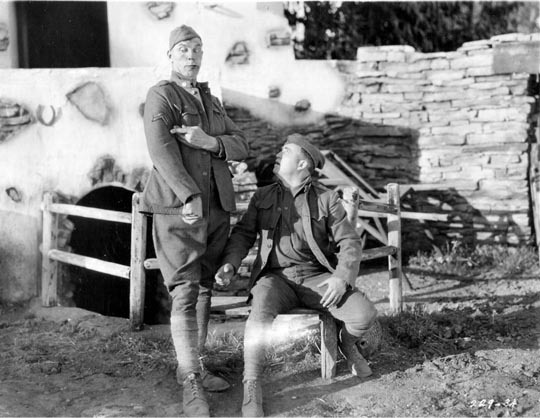 Just as the soldiers get their boots stuck in the deep farmyard muck, the film bogs down in a soggy mess of buddy comedy and movie romance (although there are moments which hint perhaps unintentionally at the threat posed to French honour by the presence of the randy doughboys). Almost every scene is stretched to the breaking point, sapping it of whatever potential charm it might have had. Almost an hour-and-a-half has passed before the call finally comes for the unit to move up to the line and by then it seems that everyone has forgotten that there’s a war on. After an interminable goodbye between Jim and Melisande, Vidor suddenly shifts gears and there are some impressive shots of the army moving forward across the landscape. But when it comes time for Jim and his friends to engage with the enemy, the action is poorly and confusingly staged. 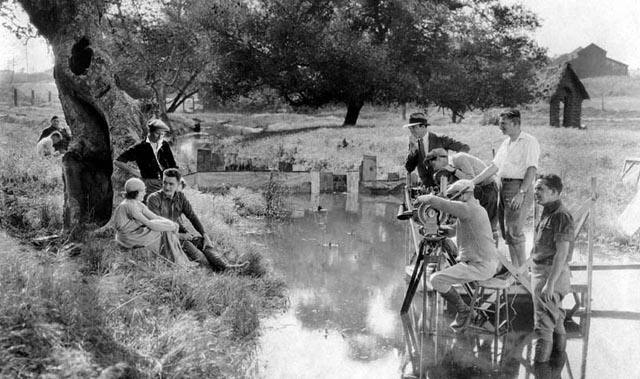 It’s not that we ought to have gotten into the mud- and rat-filled trenches – there were other kinds of combat in the war – but that the director can’t seem to make what he’s showing coherent. The Americans move forward into the woods with bayonets fixed, faced first with a line of hidden snipers who pick them off one by one; but then Slim shoots a sniper out of a tree and a horde of Germans suddenly emerge from the bushes with their hands up in surrender. Our boys keep moving forwards and next face a line of machine gun nests, which cut down many more men around our trio before they’re silenced with grenades. Then they emerge from the woods onto a vast open field … and still we have no idea what their objective is, where they’re going, and why they just keep walking forward, now into artillery fire and clouds of gas. It’s as if Vidor is trying to create a symbolic progression of the escalating forces the men face, but stylistically all of this is portrayed with a kind of naturalism which goes against the grain of metaphor (yet lacks the grim realism of, say, Raymond Bernard’s superb Wooden Crosses  or even the more generalized anti-war impact of Lewis Milestone’s All Quiet On the Western Front ) … and so we get all this action without context or meaning. And then the three friends find themselves in a shell hole and the film bogs down again. A message reaches them that one has to go and knock out the machine gun which has them pinned down, so Slim heads off across no man’s land in the dark; when he’s wounded, we get a lot of yelling from Jim and Bull of the “you dirty rats, you shot our buddy!” variety and Jim disobeys orders and goes out to rescue Slim, with Bull following. With both his friends dead and now with one leg missing, Jim arrives home for a sentimental reunion with his mother (who has multiple flashbacks to his childhood for good measure). Yes, the film has reduced the entire war (which for the U.S. actually lasted a year-and-a-half) to that single day and night of pointless action. The Big Parade is an ambitious film which nonetheless succumbed to that hoary old Hollywood dictum that every movie needs a love story to hold the audience’s attention; the war and its horrors are mere background to the rather shallow emotional life of the hero, Jim Apperson. The same problem afflicted William Wellman’s epic Wings, made just two years later, but Wellman’s passion for flying at least resulted in a more impressive depiction of the war than Vidor manages. This entry was posted in Commentary, Review and tagged Actors, BFI, Blu-Ray, Directors, Docu-drama, DVD, Flipside, Horror, Science Fiction, Silent Film, War Films. Bookmark the permalink.